A doorbell rings at a house-hold in Kalkaji, the lady of the house comes to see who’s at the door. She had ordered her groceries from Grofers and is greeted by the ever-smiling delivery boy holding a big bag full of her regular Arial and Atta. As soon as the delivery boy finishes, keeps all her groceries on the dinning table, he asks- “Madam, card ya cash?”. Madam says- Card le lo and the grocery boy attaches his m-pesa machine to his phone and gets paid for the right amount including the paisa charge. A regular feature in our daily lives, we would all agree! Now imagine this. A farmer in a rural and interior area of India wants to buy crop insurance. He has put his entire savings into farming 2 acres of land which he has got on rent from a landowner by agreeing to share a part of the revenue that he makes out of the sale of his produce. It is imperative that he covers his crop under a crop insurance scheme to ensure protection against drop in yield due to unforeseen circumstances. 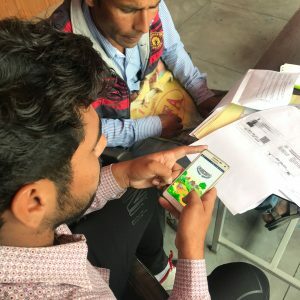 In this scenario, a local representative reaches out to him, collects the various documents from him, converts them into digital documents and then asks him to make payment electronically using his Ru-Pay debit card which is linked to his Jan Dhan account. Seems unlikely, right? But this exactly what Gramcover Insurance Brokers have done in the recently concluded Rabi season. Insurance penetration in India is significantly low and the issue is even more acute in rural India. The challenges that impact insurance penetration in India are well known ; it starts from lack of awareness, is compounded by lack of relevant products which are rightly priced and the lack of last mile distribution network and finally culminates with a lack of trust in the ecosystem to deliver when it matters most – at the time of claim settlement. Gramcover, an IRDA approved composite insurance broker, with the motto of “Derisking Rural India” is focussed on creating a unique technology led insurance distribution and servicing model which can leverage the rural human capital and make insurance available seamlessly to the rural population. Post receiving its license in December 2017, the team at Gramcover has worked with multiple insurance companies to provide coverage to non loanee farmers under the Pradhan Mantri Fasal Bima Yojana (PMFBY). In the last 3 seasons starting from Rabi 17-18, Gramcover has enrolled more than 1.4 lakh beneficiaries under the scheme. To realize this vision, Gramcover is investing heavily in strengthening their technology platform to make a number rural relevant insurance products available digitally. This includes product integration with insurers, payment gateway integration with fintechs and partnerships with relevant stakeholders in rural India. Gramcover is all about creating a safety net for the rural population through insurance. Something to fall back on in difficult times which will make them more resilient and able to take up life’s challenges head on. We are harnessing the twin levers of technology and rural human capital to reach out to and make a difference in the lives of Rural “Bharat”.